Good morning, and a very happy Monday to all of you! I hope this message finds you doing very well. I hope and pray your lives are full of love, purpose and memories. We only get one chance through this life. Make it count, and always know you have the ability to change something that isn’t bringing you joy and happiness. I apologize for the delay in getting the PET scan results from last Thursday to you all. We had a very busy weekend starting with our much anticipated family fun day to Legoland, Sea Life Aquarium and Rainforest Cafe. We had an amazing time, and it was a much needed family respite. In actuality, we did get the phone call from my local oncologist on our way to Legoland on Friday. After getting the news, I immediately got on the phone and left my oncologist in Houston, Dr. Ravi, a message as well as a text to see how he wants to go forward. I also called my local pulmonologist to have him personally review the films for his point of view. With that said, I have attached the report to this message. In summary, it was not a slam dunk great report. First and most important, there are no new spots. As a side note, this scan is an important reminder to be your own advocate, take charge of your situation, and always be in the know about what’s going on. 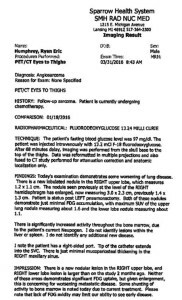 For instance, this current report remarks upon a “new” spot in my upper right lung. This isn’t true. It is not a new spot. It was remarked upon before, and we already knew about it. If we did not know or were for some reason unaware, it would change the clinical course of treatment going forward. Unfortunately, both spots grew but as always, isn’t so cut and dry. The one in the lower lobe almost doubled while the upper lobe lesion grew slightly. 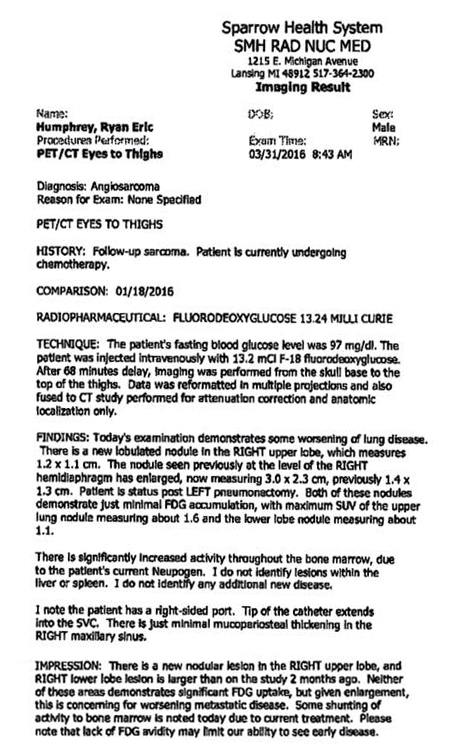 The peculiar and somewhat promising notion from this scan (besides no new lesions) was the fact that both lesions had very minimal PET uptake. They were 1.1 for the lower lesion and 1.6 for the upper lesion based on a scale from 0-15 where 0 is physiologically normal. In layman’s terms, the lesions do not appear to be very active at all. They could be slow growing, dying, or something else entirely. Furthermore, I have not coughed up blood in almost two weeks which is very reassuring. Most may not remember, but this is how the entire journey started for us. I began coughing up blood. However, I never stopped coughing up blood until after surgery. I take this as a very promising notion that something is working, thanks be to God. Dr. Ravi called me back while we were in Legoland, and my pulmonologist called me back on our trip back home. Mainly, we needed to know Dr. Ravi’s opinion on what treatment, if any, we would do since I still had chemo scheduled for today using the same regimen. Per Dr. Ravi, since the PET uptake was minimal and the fact I am currently not coughing up blood, he wasn’t convinced that the current treatment isn’t working. He stated an enlarging tumor especially with low uptake on a PET could mean several other things besides tumor progression. Some of these explanations could be an inflammatory change due to tumors dying or as Dr. Ravi described, a bleed over effect from this type of tumor. Long story short as long as there are no drastic changes in symptoms, he wants to do 2 more rounds (6 weeks total) of this current regimen and re-stage with another PET scan at that time. The further you go along a journey such as ours, the more you are able to discern good news from bad news as well as the ability to take a step back, analyze a report, and decide for yourself what to take from it. For this reason, we are grateful for this scan. There are no new tumors and it didn’t reveal anything catastrophic. Thanks be to God that we can continue on course to eradicate this awful disease once and for all! Thank you for all of your continued prayers! They’re working, but they’re working on God’s time frame. With that said, I am currently getting infused with chemo round 70. My blood work came back amazing. I attached the report. God only gave us one direction to move, and that’s forward. No reason to look back. We will win this fight. We love you all. Have a beautiful day. Dear Lord, we ask that you be with Ryan & his family, who need your palpable presence as they fight their battles. Please give them strength and heal Ryan’s body. In Jesus’ name we pray. Amen.